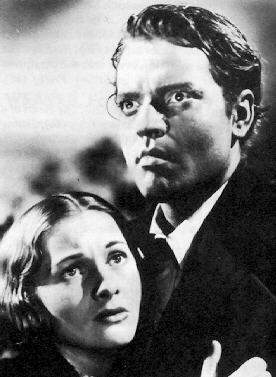 Welles with Joan Fontaine in JANE EYRE (1944) in which Welles starred as the dark and brooding Rochester. This adaptation of the Charlotte Brontë novel also featured Agnes Moorehead and Sara Allgood alongside rising child stars Elizabeth Talyor, Margaret O'Brien and Peggy Ann Garner. 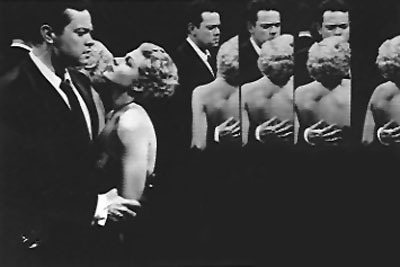 Welles with Rita Hayworth (his then-wife) in THE LADY FROM SHANGHAI (1948), a bizarre story of murder and mystery on the high seas, which Welles also directed and for which he wrote the screenplay. Welles as the title character in MACBETH (1948), another film in which he both directed and starred. On a very low budget, Welles shot this film in only twenty days. Later in his career, Welles made his most prolific contribution to filmmaking in front of the camera, acting in a variety of films in an effort to earn enough money to finance his own directorial projects. In THE LONG, HOT SUMMER (1958) for example, he played Joanne Woodward's overweight, uncouth, domineering father opposite Paul Newman and Angela Lansbury. He also lent his famous voice to several films as narrator. 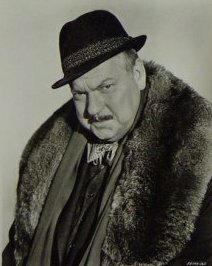 A publicity portrait of Welles as Max Buda in THE V.I.P.S (1963) which starred Elizabeth Taylor, Richard Burton, Louis Jourdan, Maggie Smith and Margaret Rutherford. Orson Welles: interviews edited by Mark W. Estrin (Jackson: University Press of Mississippi, c2002). The encyclopedia of Orson Welles by Chuck Berg and Tom Erskine; with John C. Tibbetts, James M. Welsh, series editors (New York, N.Y.: Facts On File, Inc., 2002). This is Orson Welles by Orson Welles and Peter Bogdanovich; Jonathan Rosenbaum, editor (New York, NY: HarperCollins, c1992). The complete films of Orson Welles by James Howard (Secaucus, N.J.: Carol Pub. Group, c1991). Orson Welles, the rise and fall of an American genius by Charles Higham (New York: St. Martin's Press, c1985). Orson Welles: a critical view by André Bazin; foreword by François Truffaut; profile by Jean Cocteau; translated from the French by Jonathan Rosenbaum (London: Elm Tree Books, 1978). Focus on Orson Welles edited by Ronald Gottesman (Englewood Cliffs, N.J.: Prentice-Hall, c1976). Orson Welles by Jean Cocteau (Paris: Chavane, 1950). Orson Welles by Roy Alexander Fowler (London: Pendulum Publications, 1946). Orson Welles, Shakespeare, and popular culture by Michael Anderegg (New York: Columbia University Press, c1999).